You will love this Three Panel Chinese Style Vase (it is actually made in Thailand) since it is like owning three vases in one. 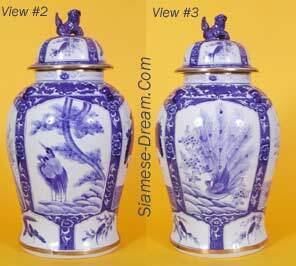 Approximately two ffet high, these vases have three different images on them, (Water Lillies, Two Cranes, and A Peacock), so by simply rotating the vase, you can have a different image facing outward. Also, these vases feature a small Foo Dog standing on the lid. The Chinese Foo Dogs were kept as guards by the Chinese emporers. You can of course use this vase for storage, but no matter what you put inside, you will definitely want to have it on display in your home. PLEASE NOTE: Because these vases are heavy and somewhat fragile, we can only send them by UPS GROUND, as that is the safest, least expensive way to send them (takes from 2 days to a week to arrive). We can only send them inside the contiguous USA (meaning we cannot send them to Hawaii or Alaska) and cannot send them outside the USA. We will not be able to send them overseas. RETURN POLICY: These vases have the same return policy as our other merchandise 9meaning ten days from day you receive the merchandise), and we refund the cost of the item itself, but NOT the shipping costs. Please do realize that if you decide to return the item to us, the shipping costs you will have to pay MAY be significant, the vases are heavy and need to be sent in a large box with lots of padding.